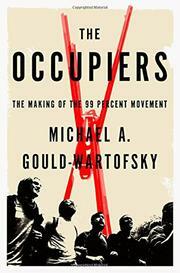 The Occupiers: The Making of the 99 Percent Movement by Michael Gould-Wartofsky was a difficult book to review. In the three years since Occupy Wall Street, I have struggled with reconciling the energy of that period, which has never been replicated during my years of activism, with the failure of OWS to advance the causes to which it brought so much attention. Reliving the experience through Gould-Wartofsky’s engaging play by play reminded me what made OWS both special and frustrating. Even though Occupy was covered relentlessly by the press during its heyday, The Occupiers is the first book to provide a thorough history of what happened before, during and after the main months of Occupy Wall Street in the fall of 2011. More importantly, it delves into the people and groups behind the protests, an aspect papered over in 2011 by refrains of OWS as a “leaderless movement.” Gould-Wartofsky introduces us to radical organizers leading less radical crowds through the streets. This combination made OWS unique and splashy, but also hastened its demise and raises questions about its lasting impact. The Occupiers travels with agility through time and space, but it is anchored in the first threatened eviction of Liberty Square, in October 2011. That was the morning that a crowd of thousands stared down Mayor Bloomberg and Brookfield Properties, and held the park.. The optimism that morning inspired activists across the country. At Liberty Square, an emboldened occupation began erecting larger structures, until the place looked like a city within a city. Another world did seem possible. At its best, Occupy Wall Street was a beautiful experiment, and Gould-Wartofsky captures its magic. The kitchen served more than 1,000 meals a day, the medical tent provided free care, the library distributed free books, all in the middle of a (quasi) public space. Artists made signs, musicians played songs, and the revolutionary “People’s Mic” amplified regular voices throughout the park. The air was charged with manic energy. People with pent up feelings of hopelessness from the Great Recession or years before had a place to call home. Even the street protests were different, weaving through streets like jazz solos, rather than ponderously marching down pre-set avenues. Michael Bloomberg, New York’s plutocratic mayor, was the perfect foil for early Occupy, his total disdain for protests and slavish defense of the finance industry only further fanning the flames. OWS was at its most potent when it was squarely positioned against the still despised banking system, before it was pigeonholed into increasingly leftist pegs. Of course, no one planned for the September 17 protest to turn into a giant, multi-month occupation. Problems inevitably arose. Gould-Wartofsky touches on the difficulty in handling drug users, the homeless and the mentally ill, particularly in balancing women’s safety. The movement became too big for effective communications, working groups splintered from the OWS structure, and those that remained bickered about money. Liberty Square became something of a circus, with foreign journalists and minor celebrities descending on the park while activists kept up the real work in satellite locations. As the fall wore on, endless confrontations between OWS and the NYPD eroded the anti-Wall Street narrative. As many at OWS pointed out in desperate attempts to right the ship, rank and file cops are part of the 99%, and shouting “whose side are you on! ?” was not a substitute for real dialogue. That sentiment may seem naïve in the wake of the Eric Garner protests, but making the police part of the story will always cap the political reach of a movement, and most people marching in the streets to reign in Wall Street do not revel in such confrontations. By the time OWS was evicted from Liberty Square in mid-November, life at the park had deteriorated to the point that one activist interviewed by Gould-Wartofsky admitted relief that the occupation was over. Those problems were well known by those who worked at Liberty Square, but other tensions simmered below the surface, namely the debate between socialist/leftist “reformers” and anarchist/horizontalist “revolutionaries”, a debate The Occupiers highlights. During the fall of 2011, the media and the public wrung their hands over Occupy’s failure to generate a list of demands, register voters or run for office as left-wing Tea Partiers. The reason for this was that many of Occupy’s leaders were reformers and anarchist revolutionaries, not young Democrats. Leftist reformers were never going to become a Democratic Tea Party, and the revolutionaries rejected the American political and economic system entirely. Of course, the huge crowds who showed up at Liberty Square and in the streets of New York ran the political gamut, and many were probably liberal Democrats, but the people who showed up first, camped, put in the long hours, ran media messaging and exercised other soft forms of leadership were primarily from these two philosophies. In fact, these two groups were embedded in the Occupy DNA from the outset, feuding over Occupy’s direction weeks before anyone would set foot in Liberty Square. For those who participated in OWS with some hope that a sustained left-wing political movement could come out of it, this realization was disappointing, but then again, there was nothing preventing mainstream political groups from using Occupy’s momentum to effect change. Occupy’s unwillingness to engage in conventional politics was not its fault. That said, the dwindling numbers at meetings and actions post-eviction revealed the radical nature of Occupy’s leadership. Just as OWS felt misunderstood by the mainstream media, Occupiers misread their own constituents. Most of the people who had joined them in the streets did so because they felt like part of the 99%. Because they wanted money out of politics. Because they were sick of corporate Democrats, or even the two-party system. But most people involved in OWS at its peak were not radical. This leads to the biggest unasked (but implied) question of The Occupiers: does this style of street protest change hearts and minds? OWS doesn’t provide evidence to suggest so. For that matter, neither does Wisconsin, where Governor Scott Walker is talked about a presidential candidate, fast food restaurants, where workers don’t make $15 an hour, or even Egypt, which is still ruled by a despotic military. Gould-Wartofsky highlights the innovations OWS brought to street protesting, social media activism and issue framing. Yet it remains unclear to what ends these tactics serve without a desire to work collaboratively with mainstream levers of power. For example, OWS has been credibly claimed to have “changed the conversation” from austerity to inequality, but can it point to any subsequent Obama administration policies? A few weeks ago, NYPD Commissioner Bill Bratton went to Albany and asked the State Legislature to amend the “resisting arrest” statute to include a new felony charge. The reason: his displeasure with how protesters resist arrest. This is a terrible law that will be wielded against protesters and ordinary citizens alike. The bill’s main sponsors are New York City Democrats. Yesterday the Occupy twitter handle asked people to contact these legislators, legislators with whom they have neither built an allegiance nor taken steps to oppose in Democratic primaries. I cannot reconcile this insistence with working outside of the political system but making demands of it. The Occupiers is a great recap of what happened during the two months that Occupy Wall Street held down Liberty Square and captured the world’s attention. Anyone who wasn’t there will be fascinated reading it, and even those who were are bound to learn a lot about what was happening in the madness around them. For young organizers hoping to lead movements, I’d consider it essential reading, and ditto for the political class that didn’t grasp what OWS stood for when it was around. In some respects, The Occupiers only scratched the surface. Gould-Wartofsky quotes a lot of discontent about the OWS elite/leadership, but we don’t actually get a peek inside their downtown office. Who were the Occupiers who controlled the purse strings, the media messaging and the massive general assemblies? How did their lives allow them to plunge into this work for months at a time? These faces were fleeting back in 2011, and they remain elusive here. Likewise, Gould-Wartofsky spent only limited time on a few key occupations outside of New York. I know from attempting a comprehensive law review piece on the Occupy legal strategies that finding good information on every occupation is a herculean task. The definitive national (or international) study of Occupy Wall Street remains out there. Of course, New York is where it all began, and Gould-Wartofsky sensibly focuses here, but I am curious what the occupations had in common across the lower 48 states. Perhaps The Occupiers’ greatest strength is the measured and non-editorial approach Gould-Wartofsky takes to a topic so fraught with tension. He lays out what happened during Occupy Wall Street admirably, and brings the reader deep into the heart of activist politics, the one kind of politics that no protest movement can avoid. Gould-Wartofsky captures what OWS did best – bringing a critical spotlight to corporate power, while hinting at what it was not, a movement with a long-term strategy for changing the policies it criticized. Activists can look fondly on OWS as the first great 21st century American protest, but if we learn from history, we can do better. We’ll always have October 2011. Postscript: When looking back over this review, I wondered if it was too negative about Occupy, which was, after all, a bunch of unpaid strangers with limited resources under enormous media scrutiny and police-state pressure. Ultimately, however, I think Michael Gould-Wartofsky liberated me to write such a critique. Now that The Occupiers has properly documented OWS’s place in history, we can challenge it, just as OWS challenged the institutions it confronted.